You are responsible for your destiny. Either you can follow someone, or be followed by others. The one who inspires others through their actions and influences others to follow them is a leader. Why do people follow some but not others, and what leadership traits does it take to become one? 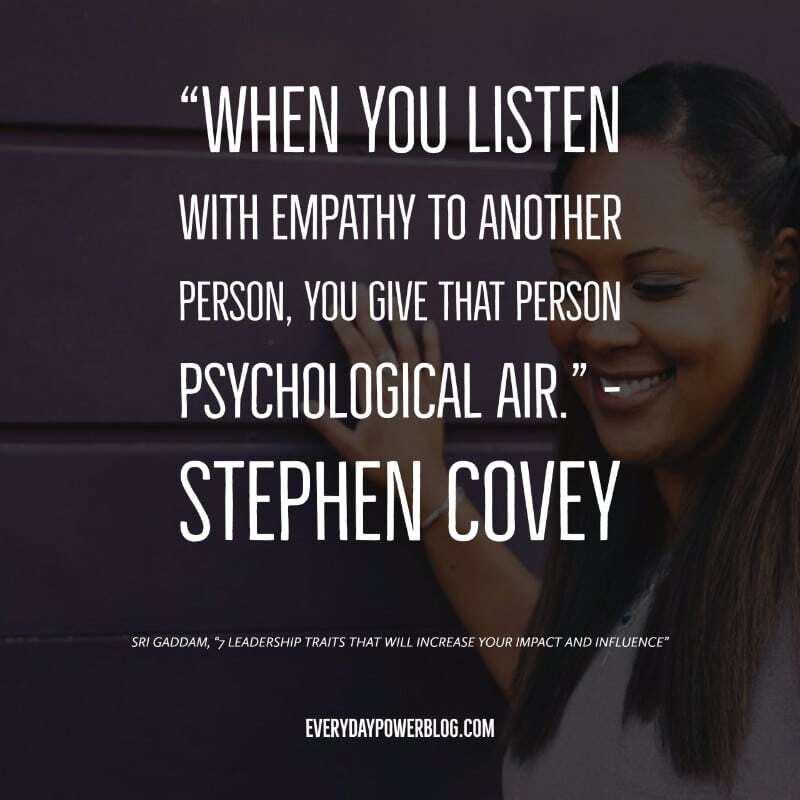 I would like to share seven of these key traits based on my interactions with thousands of leaders, my own experiences, and findings from hundreds of books as well as research articles on the subject. This creates a common goal with a sense of purpose for everyone. The leader shares his compelling vision with his team. 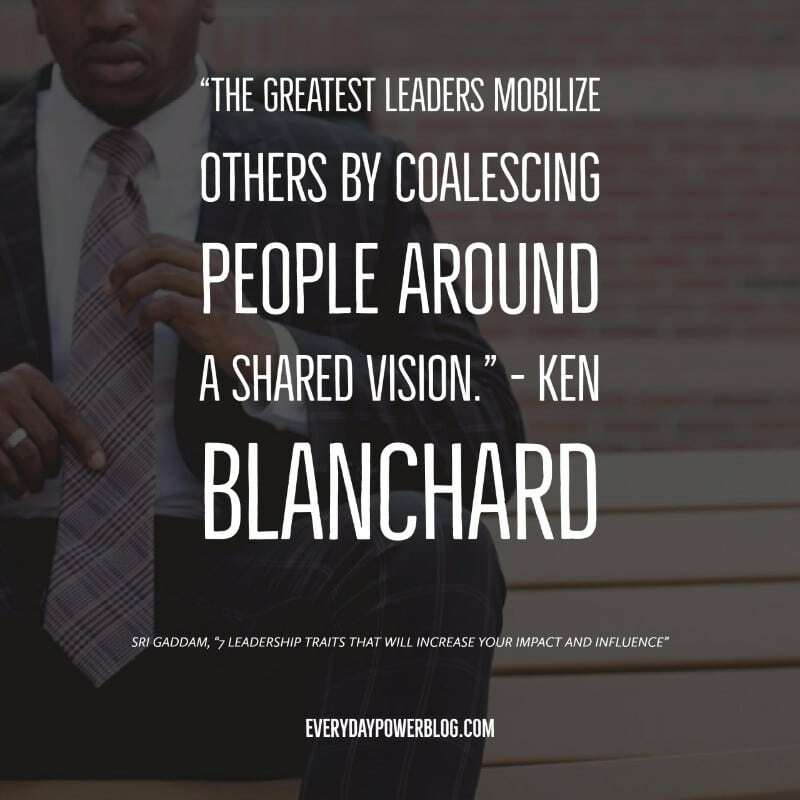 Then he works with them to get their feedback, ideas, and views to create a shared goal by aligning the individual’s purpose and dream into his. As a result, everyone is committed to achieving the same thing. There’s clarity of purpose, and each one selflessly executes tasks with utmost passion and determination. The Law of Attraction is extremely basic, but it is highly powerful. It is consistent with the notion that ‘like attracts like’. If you have positive thoughts, you’ll likely attract positive things in life. But if you constantly doubt yourself and openly project negative thoughts, the world will give you poor results. Visualize end result twice a day. Most successful leaders firmly believe and practice the Law of Attraction in turning their visions into reality. Self-awareness means: identifying your strengths (what do you do great? ), recognizing your weaknesses (what can you improve? ), and evaluating your blind spots (what are you missing?). A good leader continuously works to improve self-awareness through continuous learning. Among leadership traits, this is essential to make the right intuitive decisions in times of adversity – and to gain competitive advantage in times of prosperity. Regardless of formal or informal education, successful leaders are always curious to seek solutions to problems. Do this by reading or looking for active trainings about the topic that is relevant to your current situation, where you can apply what you’ve learned right away. Continuous education improves self-awareness. Improving self-awareness goes beyond one’s own personal experiences and beliefs. It helps leaders make better decisions when opportunities and risks show up. Social awareness is the capability to understand one’s own emotions as well as others. A leader takes others’ feelings, perspectives, and beliefs into consideration, expressing genuine care and empathy towards his followers. The best way to improve social awareness is to practice meditation or mindfulness. Someone with good social awareness brings his or her team together, win their loyalty, and create a great environment that can do wonders. Successful people make decisions based on their intuition and previous experience. A leader for example, will evaluate an opportunity by considering the core competencies of his or her organization while taking costs into account. They’ll make quick decisions, having already thought of risks involved. They do this even though at times, they may not be 100 percent confident about the outcome. Whereas others do NOT act on an opportunity for “fear of failure”, or seeking a perfect solution, leaders act on ideas before it can be too late. Successful strategy execution is saying NO to most things and focusing on very few things that matter most. This creates a sense of urgency and a culture of accountability. Defining clear goals for every individual to align with the vision and strategy of the organization, then choosing the right people for the right jobs for flawless execution is the key to success. To summarize, a leader makes a positive impact on others by doing the right things – doing them well with high integrity, strong values, consistency, and reliability. Honing these leadership traits, you can soon inspire others to reach their full potential. “In my experience, successful people have a very good intuition in identifying the right opportunities based on their experiences and competencies. This occurs at both an individual and organizational level. In fact, most people have great ideas or have come across many opportunities in life. But very few people will make it big. You have to leave your comfort zone to successfully accomplish your goals by taking calculated risks. “The biggest difference between success and failure is that successful people are determined to succeed, no matter what they do. When they come across an opportunity, they take action in a timely manner while considering potential risks. Others keep chasing perfection before they act due to fear of failure. They eventually lose focus and move on to a new idea. Then it is too late to act on it. Once successful people decide to pursue their desired goal, they consciously think about it around the clock and build a strong network that is aligned with their vision. They reach out to it when needed. But not before they assess the risk versus the reward. ‘The idea of scarcity lies at the heart of economics. It’s the concept that, in virtually every decision we make, we face constraints. In short, humans don’t have the money, skills, time — you name it — to get everything we possibly desire. Ergo, we have to make choices. Economists are keen to remind us that decisions don’t take place in a vacuum. Life isn’t only about the choices we make, but the ones we could make. This is where something called opportunity cost comes into play. It’s the term social scientists use to describe the value of the next best alternative to the option we’re considering. We actually evaluate opportunity costs on a daily basis. Perhaps when you woke up today, you decided on a big bowl of cereal for breakfast, foregoing the opportunity to enjoy eggs and toast. A little later, you opt to take the train to work, sacrificing the benefits of driving your own car. It’s still early morning, and you’ve already decided on a series of small tradeoffs. Calculating opportunity costs may seem like a no-brainer when the only objective is to increase the bottom line. No successful company is going to reinvest its earnings without considering the financial effects of different options. Because of the scarcity of resources, saying yes to one option necessarily means saying no to the alternatives. To make the best decision, one has to consider the value of those other options, too. 1. Determining the right balance between resources, risk and opportunities. 2. Determining your desire/ability to tolerate risk. 3. Assessing that risk through a well-conceived business plan. 4. Determining what “success” or your reward will look like. 5. Making a decision quickly and with great purpose. 6. Executing your game plan, maintaining focus, and persevering when times get tough. In my view, successful entrepreneurship is envisioning snapshots of future building success scenarios, way ahead of others and building pragmatic strategies to convert the vision into reality. More importantly, organizational success is best achieved through identifying and harnessing others’ aspirations, providing them with an environment that facilitates their goals while inspiring them to reach their full potential and leads them toward mutually beneficial results that are aligned with the organizational goals. In the contemporary business era, one needs to show what difference he or she made in the world and the innovation his or her business brings to the table. The measure to success and sustainability in the business space is about growth, how many people they cover, and how extensive is their business. Growth of business is not necessarily how much wealth they have kept as reserves or surplus, but it includes their vision, market scale and scope, flexibility, innovation, self-awareness, adaptability, and recognizing challenges as potential opportunities. In a nutshell, entrepreneurial leadership is learned behavior that happens unconsciously and refined over a period of time with a consistent behavioral approach. Every human activity is needs-based. The proverb, “Necessity is the mother of invention” (Plato), explains this phenomenon. Every business enterprise emerges out of an idea. An idea changes life, it also influences many more. To begin with, an initial idea is hazy and imprecise. The architect of the idea chases it, spends considerable time on it, and finally beats it into a shape at the conscious level. Once it assumes a concrete and definite shape, the idea manifests itself as a vision for the author of the idea. In the second phase, once the idea is firmly developed, the entrepreneur inspires people to reach their full potential while influencing them to align their goals in achieving organizational vision. At this stage, the entrepreneur’s strategy is to bring key personnel under his or her umbrella through a set of influences. The entrepreneur acts as a role model for everyone down the line. In this process, the entrepreneur emerges as a man or woman of values, vision, dynamism, and consistency, capable of influencing people in achieving common goals with the entrepreneur’s leadership style while maintaining the organizational culture. In the third phase, the entrepreneur evaluates an opportunity and acts in a timely manner considering core competencies of his or her organization while considering the cost. Most successful entrepreneurs make decisions based on their intuition and previous experience. When they come across an opportunity, they make quick decisions without wasting their time while considering the risks, even though they are not 100 percent certain about the outcome. Once entrepreneurs firmly believe in an opportunity, they influence and align people in achieving the common goal and they develop a positive momentum. They figure out a solution as part of their journey, whereas others (non-entrepreneurs) do not act on the opportunity due to “fear of failure” or seeking a perfect solution or they move on to the next idea before acting on the previous one or act when it’s too late. In the fourth phase of core competency development, entrepreneurs initiate and redefine a strategy considering acquired experience and domain expertise within the trusted network as to how his plans can be executed. In this phase, entrepreneurs aim at building or acquiring key resources who believe in their vision and who have complete trust in their leadership. A high level of self-awareness helps leaders in understanding strengths and weaknesses. If they drift from their center of focus, leaders with strong self-awareness can get back on track easily without being lost in the world of temptations. I strongly recommend continuous education for every entrepreneur or leader to remain competent and updated constantly in order to make the right business decisions at the appropriate time. At the same time, leaders can advise their key team members on improving their core competencies for mutual benefit. In the fifth phase, strategic execution starts with the culture of accountability, prioritization, and timely decision-making on key strategic and operational initiatives. Successful execution comes with clearly defined roles and decision-making rights that are aligned with a proper compensation structure to motivate people to act in the best interest of the organization, rather in their own individual interest, and well-defined communication channels that feed required information in a timely manner. The final phase of gaining competitive advantage: Upon acquiring required core competencies, entrepreneurs believe in their core values and purpose and they aim at creating a sustainable culture of accountability to gain competitive advantages such as operational efficiencies, value creation, ease of use, superior product or service quality, speed to market, and so on. Thus, a system becomes operational with its own business orientation, alignment, and culture. What begins as an idea or vision in the mind of an individual becomes an obsession for the entire organization. They pursue it with passion and determination to gain a competitive advantage. As a result, a rich, organizational culture emerges that cannot be easily imitated. Finally, the author of the vision emerges as an invincible entrepreneur with the ability to realize all of his or her set goals. Successful people will have clear purpose in mind. Right purpose will unleash one’s passion and help them to achieve their ultimate goal with a burning desire. First identify your strengths and weaknesses using a self-assessment feedback survey. Then identify the gaps that you need to work on to reach your full potential. Most people get feedback from others. But due to lack of self-awareness, they tend to believe them completely and take actions accordingly. Some people never take action on the feedback because they believe they understand the situation better than anyone else, based on their experiences and beliefs from the past that may not apply to their current situation. People’s self-awareness is based on what they have experienced and seen in their life. Improving self-awareness goes beyond their own personal experiences and beliefs and changes them, based on the feedback from new experiences in life, professional help, or continuous education. Great leaders and managers possess excellent self-awareness. As a result, they identify and delegate activities to people who are better than they are in motivating and inspiring them toward achieving common goals. 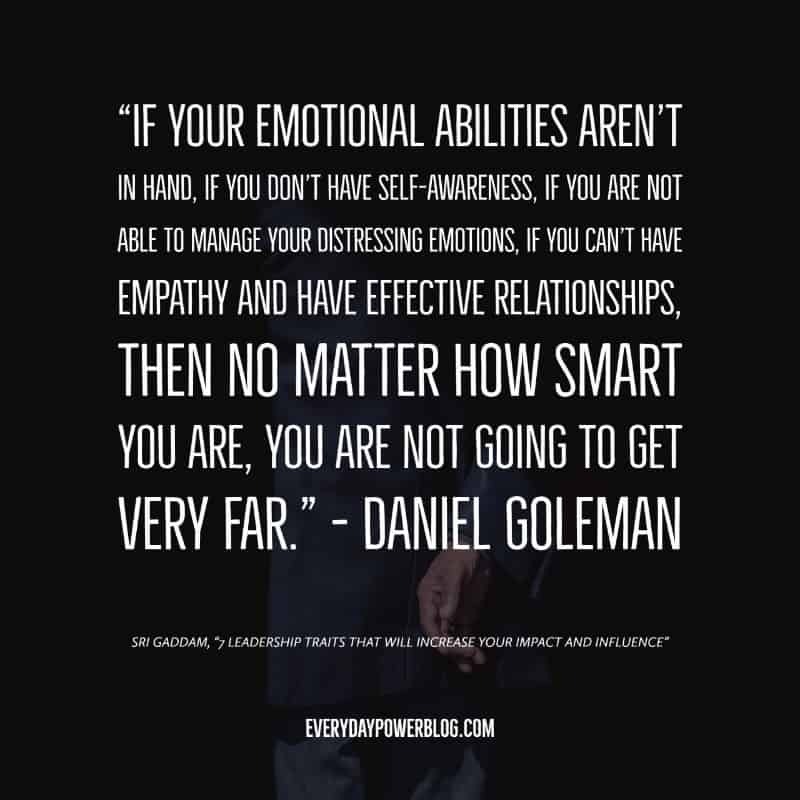 Once you understand yourself with a clear vision in mind, then it’s easy for you to understand others’ strengths and weaknesses, and help them to improve their self-awareness and become better leaders. A leader is a person with high integrity, strong values, consistency, and reliability. The leader makes a positive impact on others by doing the right things and doing them well, thereby inspiring them to reach their full potential. 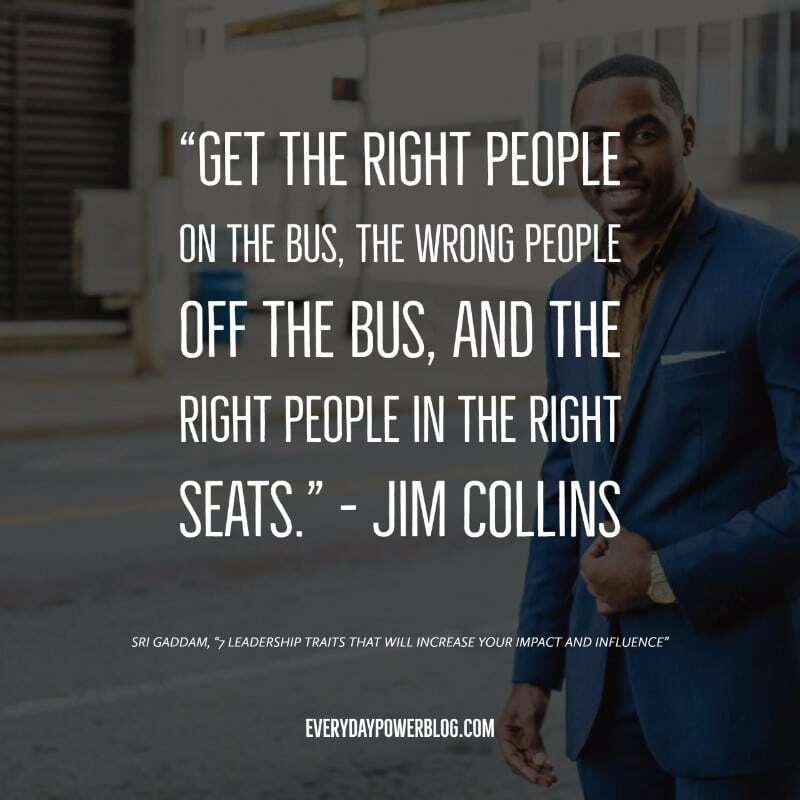 Once the right people are in the right seats, then develop trust and influence people through consistent and transparent behavior while motivating them to reach their full potential with right compensation methods in place. A competent leader with self-awareness can inspire and influence others for change. At the same time, a person without self-awareness can never change. Changing your beliefs is the most challenging task. Have patience and give ample opportunities for others to understand you and your values with your consistent and predictable behavior, and never ignore people you care about most. Once you change others’ beliefs with your influence and positive experiences, they will be aligned with your values and adopt your culture. Good or bad is a perception. It all depends upon one’s experiences and beliefs based on the environment he or she is in. If you believe in something that’s totally your perception, it doesn’t mean you are right. If you want others to believe in what you believe, they must experience a few triggering events by observing your behavior and positive reactions in a given situation. A good leader first adopts the existing culture before trying to change it. Successful leaders must also be very good at developing trusted networks of people who follow them, not because of their position or power, but the leader’s inherent skills and power. Always help people within your network and build their trust before reaching out to them. Sometimes you don’t have to ask—they care enough. It just happens. Mahatma Gandhi is the greatest leader in the modern era. I always wonder how a single person can motivate and align millions of people toward one common goal. Gandhi created a hope in the lives of millions of people and changed their limited beliefs into convictions that they can be independent and no longer be slaves. In the initial stages, the domain experience or the previous education gained by an entrepreneur is more than sufficient to get started and to make intuitive decisions. Once the entrepreneurs’ businesses enter the growth phase, continuing education helps them look at their business from ten thousand feet high, with improved self-awareness and confidence. They also get unbiased feedback through the network of fellow students on the concepts you always believed in. Eventually it helps him to change old habits or beliefs; it also helps him take better decisions. Regardless of formal or informal education, successful people are always curious to seek solutions to their problems. They continually feed their appetite for knowledge in their focused areas. Their drive is to make intuitive business decisions in identifying and acting on opportunities they come across. Continuing education improved my awareness and created confidence in my making better decisions. All these were helpful in developing and reaching out to my trusted network for advice based on various personal or business situations in life. A successful person learns from others’ experiences while taking advantage of continuing education to formulate frameworks for business strategies, learning from others’ mistakes and successes in the past, and training the subconscious brain to make intuitive decisions in any given situation. Successful strategy execution is more about saying no to many things and focus on very few things that matters most, while creating a sense of urgency and a culture of accountability. Defining clear goals across the organization that are aligned with the organization’s strategy using strategic tools such as One Page Strategic Plan (OPSP) for every key person in the organization. Hire slow and fire fast to ensure right people for the right jobs and developing a culture of accountability, Identifying and removing potential barriers that may cause disruptions in achieving key organizational goals. Always setting aside time for strategic planning and execution while not getting carried away with tactical day-to-day operational issues. Defining, reviewing, monitoring, and providing feedback on Key Performance Indicators (KPIs) on a regular basis, and ensuring that everyone’s KPIs are aligned with the organization’s goals. Defining a compensation structure to reward behaviors that drive desired results. Communicate and link the message to various levels in the organization to facilitate making timely decisions.